You thought that holograms were just the hopes and dreams of Trekkies and Star Wars fans? Well, we’ve finally seen the future and the geeks were right. Don’t get me wrong. Holograms are nothing new, but haven’t been perfected yet. But this notion has now been challenged thanks to the recent appearance of the late rapper, Tupac. Every year, artists of all sorts perform at the Coachella music festival in the town of Indio, California. This year was no exception. Dr. Dre and Snoop Dog took the stage during their set at the festival, but little did the audience know that the rapping duo had an ace up their sleeves. This past Monday, videos from the concert had surfaced featuring a resurrected (and a very life-like) Tupac rising from the stage and giving a two song performance with Snoop and Dre. 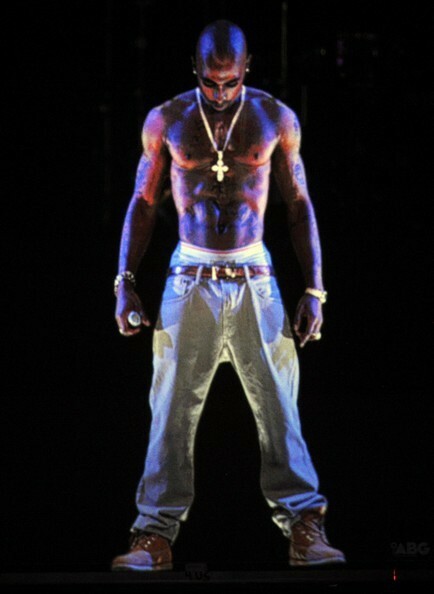 Now we all know that the late rapper has been deceased for some years now, but to bring him back in the form of a hologram is something truly impressive. And this was all made possible by AV Concepts through the vision of Dr. Dre himself. The intriguing part about the hologram is that it looked real. Too real. The details were exact down to the signature tattoos, jeans and Timberland boots. So does this mean we have a new form of entertainment on the horizon? A we going to continue to raise artists from the dead? Check out the futuristic performance of Tupac below. Clarification: While the Tupac illusion has been branded by the companies behind it and its technology as holographic and referred to in the media as a hologram, it is in fact a 2-D image projection. Holograms are 3-D. The illusions produced by AV Concepts are 2-D images that give the appearance of being 3-D.